Every year, more than 350,000 Americans undergo anterior cruciate ligament (ACL) reconstructive surgery. That number is rising fast, particularly among adolescents. During surgical repair of the ACL, replacement ligaments from cadavers or from the patient's own body are anchored to bones with permanent screws. It's a process with serious drawbacks. The tissue rejection rate from cadaver tissue can be as high as 25 percent. Transplanted ligaments tend to remain stiff and never fully integrate with the body. And within 12 years, nearly 70 percent of all patients develop osteoarthritis. 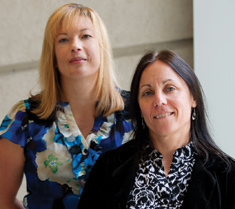 In 2004, Professor Ellen Arruda, a mechanical engineer and specialist in tendon tissue engineering, and Professor Lisa Larkin, a muscle physiologist and muscle tissue engineer, collaborated on a research project funded by the Defense Advanced Research Projects Agency (DARPA). The goal was to develop a human-machine interface that would connect muscle to an artificial limb. "Our skill sets are a natural fit, and we were both intrigued by the huge hurdle of matching biology and mechanics with existing tissue," says Larkin. Four years ago, the two scientists set themselves a fresh challenge: creating a new paradigm for ACL reconstruction. As Arruda explains, "We wanted to see if we could engineer tissue interfaces outside of the body, using a scaffold-free approach." Rather than adapting the conventional scaffold-and-screw design, they devised a bone-ligament-bone construct, a novel technology that uses the patient's own bone marrow stromal cells to grow a new ligament with boney ends for attachment to the bone of the patient. "In essence, we wanted to develop a scaffold-free technology for complete ACL recovery," Arruda explains, "one that would integrate with the native tissue, fully restore biomechanical function-flexibility as well as strength-and avoid any future risk of osteoarthritis." Based on the latest data points from a pilot study using sheep, the two researchers have succeeded. Data shows that use of the new construct results in complete healing of the entire bone tunnel. What's more, after six months the new technology achieves 50 percent of the stiffness of the native ACL and 95 percent of the load-carrying capacity of the native tissue. And what was the response to this paradigm-shifting technology? "At first, the most common reaction from surgeons and potential funders was: 'This can't be done,'" Larkin recalls. "U-M Tech Transfer was instrumental in helping us locate funding for pilot studies that proved it could be done." In the summer of 2009, Arruda and Larkin worked with TechStart consultants. The resulting market research provided them with a useful overview of market opportunities as well as a series of next steps. "That experience was instrumental in pointing us in the right direction," says Arruda. "Now that we can make human-sized, implantable ACL replacements, we'll be pursuing FDA approval." ACL trauma is on the rise, particularly among adolescents, and knee injuries are now the leading cause of high school sports-related surgeries. This new tissue engineering process developed by Professors Ellen Arruda and Lisa Larkin uses a patient’s own bone marrow stromal cells to grow ligaments and bone attachments that can be sutured into place with no need for scaffolds or permanent screws.